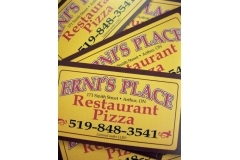 Erni’s Place is a family owned and operated restaurant in Arthur, Ontario. Erni’s was established in April of 2010 by myself, Tom Ernikoglou and my family. Since then Bill, Anna, Kiki and myself have been working diligently to make Erni’s the destination for great food. People from all over Ontario travel up to Arthur to enjoy our delicious meals. People travelling up to cottage country stop in for a quick bite, to enjoy our patio with a cold beer, or for an ice cream cone. Erni’s is known for our great service, atmosphere and great food but it is our pizza that people love the most. With our secret family receipes for dough, sauce and cheese created by us, the Ernikoglou’s, our pizza is the best in Wellington County. So why go somewhere else? We have everything your heart desires on our menu, our staff is the friendliest around and most importantly you are treated like family! Every one is welcome at Erni’s Place!